Yeay! I'm finished with Westward III. although I am late from my target. it should be done on Monday but i was so dumb so it had to be today. Anyway, its not completely my fault. the power that be only grant me, well uh, a not to be proud of laptop. Had it been higher specs, i might be able to play it perhaps in a day or two. Anyways, whats new today? The usual cursed administration matters. We had come back from holiday to classes and found out without notice that most classes had changed venue. I had to change class twice for being in the wrong class just this morning. I mean, WTF? The least they could do is place something on front of that classes or else dont change the venue at all. I mean, there's nothing good about the new venue anyway. just the same. might as well dont change at all. What I most cant stand was I had to be late for 15 minutes for Prof. AB's Jurisprudence class! Of course this persona is the coolest human being while maintaining his greatness (take a bow. lol) while all of us shuffle into the class. We checked the new venue and actually waited there but some students plus the lecturer didnt know about the new venue so they just stayed at the old ones. While they started the class already, we were still waiting at the new venue. The lecturer thought we came from a class. actually no. but still, it wasnt our fault. So he had to lecture US on being a three quarter lawyer and everything so we must'nt be late and the lecturers should disperse the class early and condemning the administration for putting classes far away from one another etc etc. I dont mind he veering out of topic cos he always gets back on track in the end plus whatever he said is gold (well mostly) coz he's THE Prof. AB. Well it doesnt matter anyway cos Jurisprudence is a reading topic. Plus, final year is mostly like independent thing, so whatever the lecturer said doesnt matter much cos we must study by ourselves. By the way, I went through a lot just to get into his class. Loved my schedule this semester. I havent had distinguished people teaching me for quite some time. I dont exactly know how long but its been a while. I cant drop my lecturers name for fear of being discovered haha. BUT I did worked for 'Prof. Dumbledore' and had submitted the completed task some days ago. The second most important thing is I avoided STR class. I initially was in HIS class but I did what i always did when i want something and i made it! so i am now in MR class. Sorry STR, but ure just too crazy for me. How can you not understand that we are already in the only place in the coutry where the system requires us to take double of everything, and yet HOW DARE YOU act like a DIVA. oh well, you didnt get me NOW so I have nothing against you YET. Oh well, I'm EMO cos I just escaped from a NEAR DEATH EXPERIENCE. I feel sorry for the remaining victims though. Already saw STR 1000 pages notes at the photocopier. As if we only learn THAT subject this whole semester. well good luck reading people! Well thats life. you got medium lecturer all the times, crazy ones almost equal but the great ones well just a bit. I had PSYCOPATH lecturer last semester. even my MOTHER agreed (my parents always disagree with me) and even offered RM50 for re-checking should i ever flunked that subject. that one didnt even come to class but thats not an excuse for that one not to mark our paper and impose his/her expectation as if we all aspire to be the textbook author. I got C for that one. I cant start on this one. its going to be never ending story. We had some lawyers teaching us practical subjects this semester. One guy said he will bar us from examination for three times absence. Wargh! so crazy! the ordinary minimum requirement was seven (i guess) but no, he had to had three. BTW, WILL I GET AN A FOR ATTENDING YOUR CLASS? (well, its not like aku ni kaki ponteng tapi memang takleh blah la bile lecturer nak DIVA-DIVA ni). I JUST DONT GET IT. these people they dont understand. out there, not many people have all the time in the world to investigate why your CGPA is below 3 etc. they wont understand when we said we had to do extra works. more classes than ordinary law students at other institutions. we had to study more. we are graded on those subjects. we dont complaint on learning extra knowledge. we just want them not to burden us more than necessary. some lecturers even checked our notes (like in high school), ordered us to buy new statutes just because we own handphones, and watch what we wear. We want to be lawyers not some crazy people like THEM. So, just get done with it already. dont you had enough already? just let us study peacefully so that we can take care of our CGPA because now thats what matters. Well maybe when people start checking how we handle our financial, our notes, our attendance and our books to land us a job then we can focus on that. I said all this because its true. I saw law firms vacancies for chambering/attachment students in front of Student Affairs Div. They wanted people with certain CGPA to apply. Its true also that big firms will check your CGPA before accepting you. this is relevant because CGPA signify your performance without having to check in detail. CGPA entitles you for an interview with big firms. now thats when they will have time to analyze. but not before that. kapische? Today is 1st Muharram 1430. the first day in the Muslim Lunar Calendar. Muharram is one of the four months of the year in which fighting is prohibited. the word is derived from the word ‘haram’ = forbidden. So, I guess this month we must not pick a fight with anyone and people, do not pick a fight with me kay.lol. Anyway i'm taking the opportunity to wish all of you a Happy New Year 1 Muharram 1430. and yeah, Happy New Year 1 Jan 2009. lets practice writing '2009' from now. haha. and btw, happy fasting to those who decided to observe Asyura. Last year, we had eclipse (sun and moon became parallel to one another) hence we had our new year on the same day as Gregorian new year. Now the cycle wasnt parallel anymore hence we celebrate earlier coz the moon works faster. well, just so u know! Maal Hijrah means migration. On this day, Muslims commemorate the Prophet S.A.W 's victory that was symbolize by the migration from Makkah to Madinah on the year 622 A.D. The Migration symbolize the beginning of Islamic Era where Madinah became the first Islamic State in the world with the first perfect and written constitution regulating the state containing detailed discussion of the prerogatives and obligations of the ruler as well as other immediate requirements, including a kind of social insurance for the needy, and where the Prophet S.A.W was the leader/ruler of the state. Maal Hijrah also means migrating from something bad towards goodness. Hence we can also take up the opprtunity towards betterment of our self. This year, i'm trying to live healthily. I dont want to jinxed my budding healthy lifestyle by elaborating here. Lets wait until I am so used to it and comfortable of discussing it. Lets just say after a few things done, I feel a lot better mentally and physically. what a good way to start a new year. very positive of me! hope i inspire people. haha. I decided yesterday that i want to play games on my not so free day. Psychologically speaking, I want to do something that i can actually finish. So I played three games. Finished two of em and the above pics are the Third game that I still havent finished which made me like it very much and made me write about it here. Forgotten Lands - First Colony is a Real Time Strategy game with beautiful graphics. There are many stages to complete (so far i've reached level 31). Each stages are set with different goals. some goals are very challenging that i failed once and had to start over (the same level, of course). To summarise it, it is the simpler version of the Age of Empires. The cons is, I finished each goals too soon and didnt get to appreciate my finished 'town'. Anyway, as u play along, u shall unlock all the bonus stages one by one. However, i suggest u finished all quests before began playing the Bonus Stages as the Quests actually trained you for the Bonus Stages. I enjoyed playing the game, shikashi I still like Westward I and Westward II better. Nevertheless, Forgotten Lands is still the best compared to any games of its type (other than Westwards). Well, I've provided the links for further info on the games. So feel free to check it out. Other than that, this game is so easy that an 8 year old could play it. Memandangkan aku bleh pegi mane2 sesuke hati aku dan bile2 mase yg aku suke, aku membuat keputusan untuk merealisasikan rancangan2 aku untuk makan di kedai2 yg aku dah buat mental note nak makan suatu hari nanti. Siang hari di UIA time cuti agak bosan bagi aku jadi aku menceriakan suasana dengan merancang menu harian. ahaks. Jadi aku tak bosan dah. Review: Aku dah sepanjang hari tak makan semalam. so balik dari Cheras aku pun drive ke UIA sambil pikir pasal makanan. tetibe aku dapat idea nak pegi mapley ni coz aku selalu makan kat tmn melawati and lalu depan kedai ni tapi tak pernah berkesempatan nak melawat. Untuk pengetahuan semue, kedai ni agak tersorok. aku datang dlm kol 3pm so almost empty la kedai dia. aku tengok cam bersih je. lebih bersih dari NZ curry house. Akupun hairan apsal org tak menghargai kedai ni. tapi mungkin gak pasal dia tersorok. akupun tengok2 beriyani and lauk dia. boleh dikatakan tak jauh beza ngan NZ. So aku cakap aku nak beriyani bungkus. so diapun bungkus, selonggok nasik dia kasi sama aku. pastu aku cakap nak ayam goreng. dia pun kasi chop itu ayam (bahagian yg aku suka) pastu dia tgk cam sikit dia pun tambah lagi. aku dah risau dah, dia kasi aku bebanyak ni mahal ke tak? setakat ni dah ckop dua orang makan sampai kenyang. pastu aku cakap mau kuah campur dengan kobis goreng. semuanye dia kasi in generous proportion. Now this is what i call Indian Style! its not indian style if you dont get big proportion. time nak bayar aku dah kecut dah. sekali dia kata rm6.50. Wah, enam hengget jek? rugi aku tak amik ayam kurma tadi. ingatkan mahal kedai ni. takpe disebabkan aku hepi, next time aku bawak kaum datang. 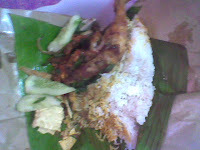 Nasi Kukus ayam dara, Tmn Melati. Review: Hari ni aku bercadang nak makan double beef prosperity burger. Aku mengidam pasal tengok iklan kat tv. so aku pun drive g McD Tmn Melati. Sampai jek drive-thru aku bapak terkejut tengok harge burger tersebut. dahlah zaman sengkek nih. PTPTN tak masuk lagi. tapi camne ni? aku mengidam! Last2 aku beli gak la burger jek. itupun tak double. beef prosperity burger sebijik dah rm9.50. pergh, gile mahal. Disebabkan aku tensen ngan harge burger ni aku decide taknak makan sekarang. akupun drive ke Kedai Ayam Dara berdekatan. Sape dak UIA mmg takleh taktau kedai ni pasal dia dekat jek ngan Terminal Putra ngan Stesen Taman Melati. betul2 kat corner towards Wangsa Maju. Aku pelanggan tetap Malin Corner, tu pasal selalu tak singgah area ni. aku pun g tengok2 lauk kat sini. ada lauk makan tengahari (aku datang kol 12pm lebih) yg nampak cam best. tapi harga taktau le. next time le aku try. so akupun cakap aku nak bungkus nasi ayam dara. 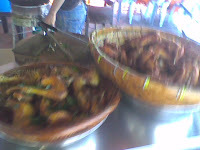 ada dua pilihan ayam = ayam kampung and ayam bandar. Ayam kampung kecik and lagi mahal dari ayam bandar. memandangkan aku nak yg murah jek so aku beli ayam bandar. eleh, lebih kurang jek. ayam gak. dia pun letak nasik banyak gile, kuah, ikan masin, timun, sambal and ayam dlm bungkusan. pergh banyak gile. aku puas hati. pastu aku tanye brape? jawapannye RM6. orrait ah tu. tapi Ayam dara kat Greenwood rm4.50 jek, cume proportion dia kurang sket la. So, nasik kat kedai ni sedap sikit jek dari yg kat Greenwood. Orrait, ni je a dua kedai yg aku blom pernah try. kedai2 yg dah try takyah la type kat sini. banyak lagi benda lain aku nak wat. roger n out. Bought Sweet Rain@Accuracy of Death at our Night Market today. Actually it was the only watchable VCD out of three so i end up watching it. My VCD does not have subtitle. I had to download and sync the subtitle myself. Takeshi Kaneshiro did a marvelous job of being hot in this movie. I basically enjoyed just watching his face. The storyline was OK. I enjoyed the story but quite disappointed by the fact that he did not fell in love with Kazue Fujiki. i could use some cute love story. The Shinigami character played by Kaneshiro was too expressionless. Btw, loved the black dog. I had a few laughs and almost moved (but did not) at the ending of the story. However, this movie entered my movie collection for the sole reason that Kaneshiro is hot in this story. Ahaha. 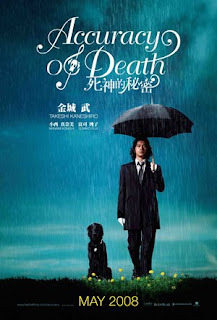 This movie is based on a Japanese novel. However it kind of reminded me of Meet Joe Black (1998). Both movies exploited hawt guys as the grim reaper. The story isnt too complicated so i might as well not write synopsis as to not be a spoiler. Aku bkan nye ade writer's block, tapi aku skrg tengah malas nak menaip. tapi tetibe hari ni aku rase nak cite kat sini pasal aku hepi dengan gigi aku. aaa? apsal aku hepi? ooo ceritanye begini: disebabkan aku melepak kat uia je sejak isnin lepas (aku ade la wat kerja berfaedah spt mengemas bilik, wat keje research dll) maka aku berpendapat eloklah aku ke klinik gigi. kalau tak cuti memanjang penuh jek klinik tu. so akupun g ah wat dental check up. aku nak poyo sket kat sini la kan iaitu sejak aku sekolah rendah gigi aku mmg tak pernah ade masalah seperti berlubang atau berkarang mcm bebudak lain. pastu pasal aku dah masuk 4th year and tak lama lagi nak grad (yeke?) and dah berzaman tak check gigi. manela tau dah jadi apepe kat dlm tu tapi aku yg tak sedar. last sekali aku check mase memule masuk matric. so doktor pun tanye la kat aku apsal aku dtg hari ni. aku ckp je ah aku saje2 je nak wat dental check up. pastu dia pun check ah. dia kata gigi aku takde masalah. pergghh rekod masih dikekalkan. so aku pon interview la doktor tu: "doktor, ade tak gigi saye yg blom tumbuh?" pastu doktor tu kira a gigi aku. dia cakap "ada satu lagi belum tumbuh". akupun cakap "a? yeke? satu je blom tumbuh? apsal saye tak demam mcm org lain time tumbuh gigi yg second last tu?" pastu doktor tu cakap "baguslah tak demam, apsal awak nak demam plak?" pastu aku ckp "hehe takdela, ingatkan wajib demam". pastu dia cakap "awak tak demam pasal rahang awak besar, org lain tu demam pasal rahang dia kecik ataupun gigi dia yg tumbuh tu terlebih besar". pastu akupun bangge dengan rahang dan gigi aku pasal rahang aku besar and gigi aku tumbuh secara normal. ahaks. maka akupun berterima kasih kat doktor itu kerana membuang mase ngan aku tapi dia cakap baguslah aku dtg check gigi. maksudnye tindakan aku ni bijak la. kawan2 contohilah aku. kuikuikui.